“Miss Coco Peru came across as such a genuine person, filling the entire theatre with laughter and smiles. She encouraged every individual in the room to own who they are, no matter who that might be." 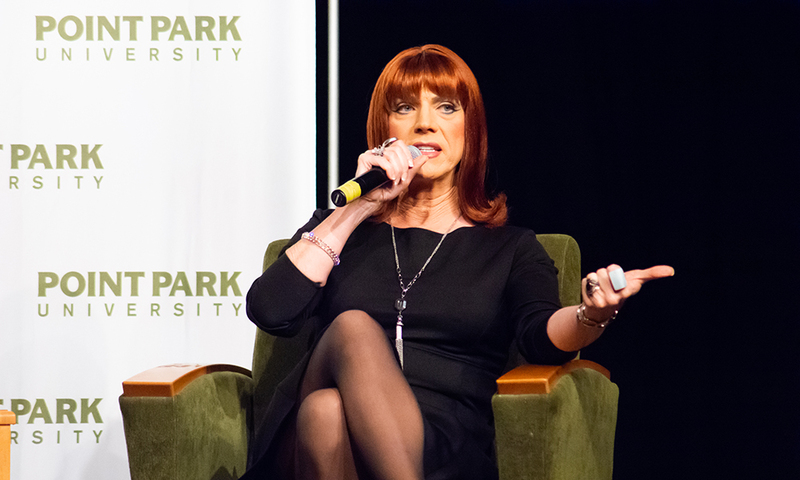 Just one week after starring in an episode of the TV show Will & Grace, Miss Coco Peru chatted with students and performed two monologues garnering standing ovations at an event hosted by Point Park University’s sports, arts and entertainment management club. Sponsored by the University’s Center for Media Innovation and the Title IX department, the event was free to students, open to the public and featured Pittsburgh drag queen Bambi as the emcee. “Miss Coco Peru came across as such a genuine person, filling the entire theatre with laughter and smiles. She encouraged every individual in the room to own who they are, no matter who that might be,” said Morgan Spingola, a freshman SAEM major and graduate of the Pennsylvania Cyber Charter School. She also discussed the incredible history of the LGBTQ community and how it has led to the vibrant community it is today. Peru also shared stories about being mistreated as a child and the importance of educating youth to create a culture of acceptance for the LGBTQ community. “It was cool to hear her side of being in the drag community, how she grew up, the trials she faced versus what Bambi has faced and how the LGBTQ community has changed over the years,” explained Shea O’Neill, a freshman SAEM major from Bishop Canevin High School in Pittsburgh.